We are currently the top producing team of Keller Williams Western Realty's Bellingham office and in the top 2% of Whatcom County! 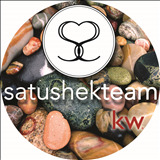 What makes The Laurie Satushek Team different from the rest and why should you choose The Laurie Satushek Team? That’s simple, because we work hard, we care about our clients, we are educated, we pay for advertising, and most of all because we are a team of four and each one of us is an expert in our team roles. What sets us apart in the selling of your home? As selling agents, we know that not only do we need to get your house seen; we need to make sure that we capture prospective buyers’ interests and show its best side. We have a professional, yes, professional published photographer, Steve Satushek that will photograph your home and if needed, we will get some staging advice or stage it for showings. We have HD high-quality photography equipment. Aside from our personal advertising attention, you will get a team of great communicators. You will get weekly reports with statistics of views of your listing, virtual tour and showings as well as everything we've done to showcase your home/property. Obviously we also will keep you updated on any interest or incoming offers. Did we mention that in just one month (Aug '13), we sold 12 homes? FYI, the average agent in this area sells 4-5 per YEAR!